Blue Morpho Butterfly (Morpho menelaus) is an iridescent blue butterfly that lives in rainforests of South and Central America, including Brazil, Costa Rica, and Venezuela. The Blue Morpho Butterfly is a species of neotropical butterfly that has brilliant blue wings (the females are are not as brilliantly colored as the males and have a brown edge with white spots surrounding the iridescent blue area). The undersides (visible when the butterfly is resting) are brown with bronze-colored eyespots. 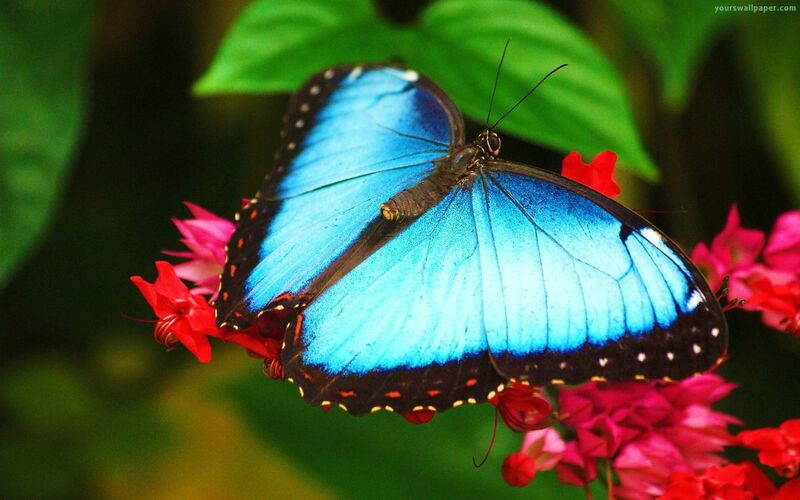 The Blue Morpho has a wingspan of about 6 inches (15 cm). Adults drink the juices of rotting fruit using their straw-like proboscis. The caterpillar of the Blue Morpho is red-brown with bright patches of lime-green on the back, and it eats the plant Erythroxylum pilchrum nocturnally (at night).